XML stands for Extensible Markup Language. It can be considered as a simplified version of the Standard Generalized Markup Language. It is a text-based markup language and a World Wide Web Consortium standard that allows one to create his or her own tags. It has been widely popular as it has simplified the business to business type of transactions on the web. Due to its advantages, it is on its way for becoming the standard for data exchange on the web. The tags in XML are quite different from HTML, as XML tags recognize the data rather than focusing on the way to display it. 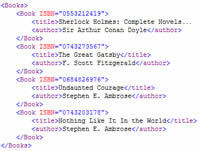 XML content is contained inside tags. Tags consist of content and the description of the enclosed entity. An XML document consists of a prolog and a body. Prolog contains an XML declaration which is possibly followed by a declaration of the document type. The body comprises of a single root element and may also contain some comments and some instructions for processing. A collection of name and value pairs. It is a lightweight open standard for data exchange. It has been designed for human-readable data. Numbers, Booleans, strings, null, array, objects, etc. can be represented by using JSON. It can be considered as a simplified version of the Standard Generalized Markup Language. It is a text based markup language and a World Wide Web Consortium standard that allows one to create his or her own tags.